Learning about the Mass up close and personal! At ASA we are Forming Saints to Serve All and thus every year each of our middle school classes engage in a class retreats at school. Retreat topics range from an emphasis on leadership, to times of meditation and prayer. These retreats are an extension of religion class and our numerous prayer experiences integrated into our school calendar. They provide an opportunity to explore The Great Mysteries of our faith, strengthen our personal relationships with Jesus and celebrate what it means to be Catholic as we work to reveal our truly Catholic community at All Saints Academy. Retreats are planned by ASA staff and highlight our core values of Faith, Learning, Loving and Serving by including guest presenters, scripture study, discussion of important tenants of our faith, times of group work, service projects, team building, and games. Jesus BOTH Human & Divine! Each grade has a specific theme for their retreats. Our goal is to pray more intently at lunchtime everyday. 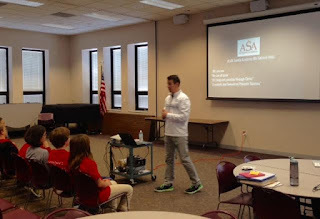 As part of the middle school "Experts Series" Coach Gietzen of West Catholic recently came and spoke with our 6th, 7th & 8th grade students about the many choices we make on a daily basis. He asked students how they make those choices and then challenged them to reflect on how their beliefs should inform their choices through goal setting. He emphasized the importance for SMART Goals. Rather than a lofty aim without clear definition a SMART Goal is a Specific, Measurable, Attainable, Relevant, Time-bound goal. 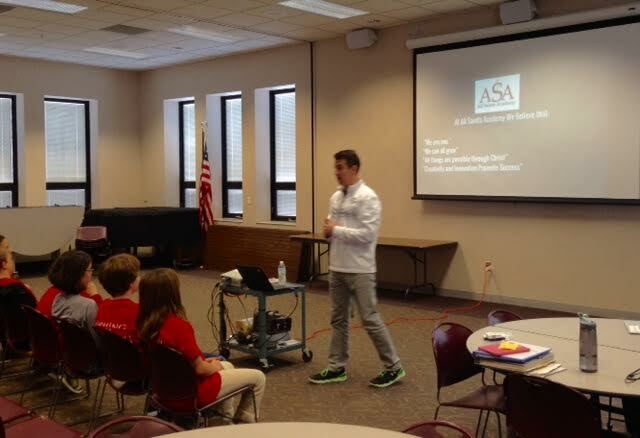 Mr. Gietzen walked the middle school students through a real life goal setting exercise. 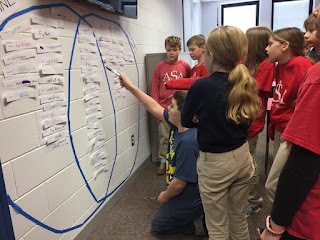 He focused in on our ASA Root Belief of "We Are One" and asked the students what are things that we do throughout the school day that can better demonstrate that "We Are One." 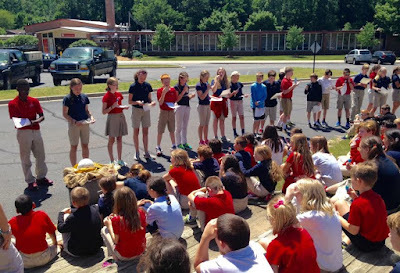 The discussion quickly landed on the various times during the school day that we pray together. The praying of the Angelus at lunchtime was zeroed in on and with Coach Gietzen's help students began talking about how this simply daily routine could be improved on to better communicate that "We Are One." The discussion focused on prayer posture, participation and tone. Eventually the group articulated that they would like to to aim to: Pray more intently at lunchtime everyday, because We Are One. So for the month of January at lunch prayer we are specifically looking for folded hands, a quiet atmosphere and participation during the praying of the Angelus. We will measure our success by how well we accomplish this task daily. Since the Angelus is already part of our daily routine and this goal seemed very attainable to the middle school students. A number of students expressed their frustration that some of their peers cause distractions and do not participate during prayer so this goal seems very relevant to the student body. There is a calendar posted in the middle school gym for students to begin tracking their time-bound progress towards this daily. 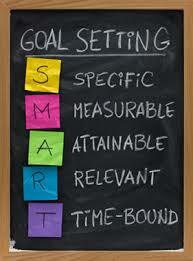 At ASA we have used SMART goals in a few other places. Because We Believe That We Can All Grow SMART goals are used for learning goals throughout the year. 7th and 8th grade students worked on general academic SMART goals with Miss Giroux at the start of this school year. 5th grade keeps a SMART goals folder with Mrs. Henke. Periodically all students spend time looking at their own MAPs data with their teachers and set SMART goals for growth in school. This recent "Expert Session" with Coach Gietzen was a great reminder that we can set goals in all areas of our life and that our beliefs should drive the articulation of those Specific, Measurable, Attainable, Relevant, Time-bound Goals we set out to achieve. We look forward to reporting back to Mr. Gietzen at the end of the month how our lunchtime prayer goals has helped to strengthen our community in further living out our belief that At ASA We Are One!